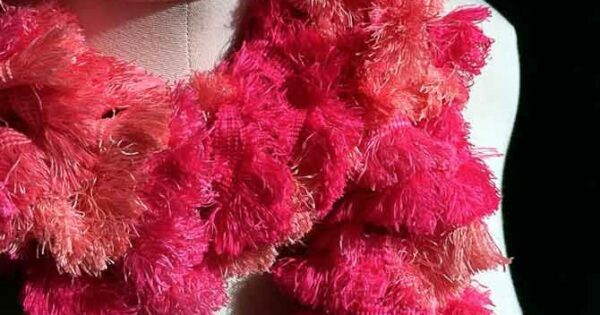 Red Heart’s Sashay Fringe yarn is a very interesting and unique product, so I wanted to talk about my specific experiences making the Positive Pink Ruffles scarf pattern. The ruffle yarn, without the fur, was very popular in the not-too-distant past and as a result there are thousands of patterns you can make. The difference is you get a bit of extra flair when knitting them with Sashay Fringe. Not only this, see the benefits of knitting with Sashay Fringe yarn. 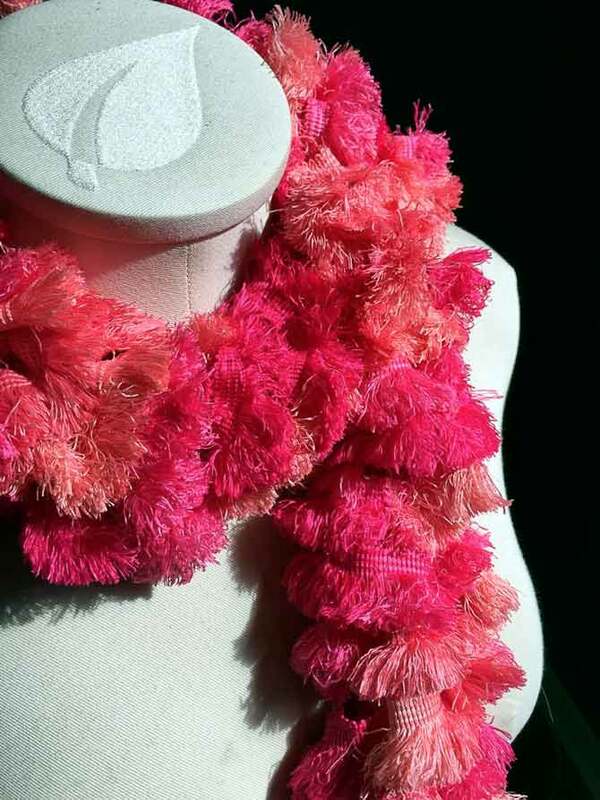 The Positive Pink Ruffles scarf pattern made with the Red Heart Boutique Sashay Fringe yarn. I absolutely love this yarn for scarves because it’s so easy, but it looks much more difficult than it actually is. This is perfect for someone who is just starting out and looking for a fun project, but also for tempting your friends into knitting! The yarn counts as a bulky, but you’re just knitting in the mesh, as seen on the how-to video. First thing is to cast on; this can be really tricky if you’re not sure what you’re doing with this yarn. The mesh already has holes in it so you aren’t doing a long-tail cast on or anything. You’re using the holes in that mesh webbing to cast on. Sashay Fringe doesn’t have the little rail road track in the top, so I would suggest starting at the holes nearer to the center. This way you won’t see much of the mesh itself as you’re knitting and the stitches you have on your needle are a little more defined. There aren’t that many stitches either, the pattern from the Red Heart website calls for 6 stitches. Trust me, this is the most difficult part of the whole thing! Once your cast on is done, it’s time to get knitting. The scarf knits up really fast, but in the first few rows you may find yourself thinking it’s incredibly ugly. This is normal, it’s like knitting lace; it doesn’t look good until you are closer to the end. With lace that means blocking, with Sashay Fringe, it means a bit closer to the end. One difference between ruffle yarns and Sashay Fringe that I really enjoyed, is the lack of maintenance while you’re knitting it. With the regular ruffle yarn you have to smooth it out as you’re knitting it to get a real ‘ruffled’ effect. The fur edge is what you’re looking to accentuate with this yarn and there’s no need to smooth it out. The weight of the fur itself makes sure the yarn isn’t bunched up within the knitted folds of the scarf. Closer to the end of the ball the mesh is folded into the fur, but that is a simple matter of unfolding as you go along. If you place your thumb in the folded groove, as you move along the strand it will open up automatically. 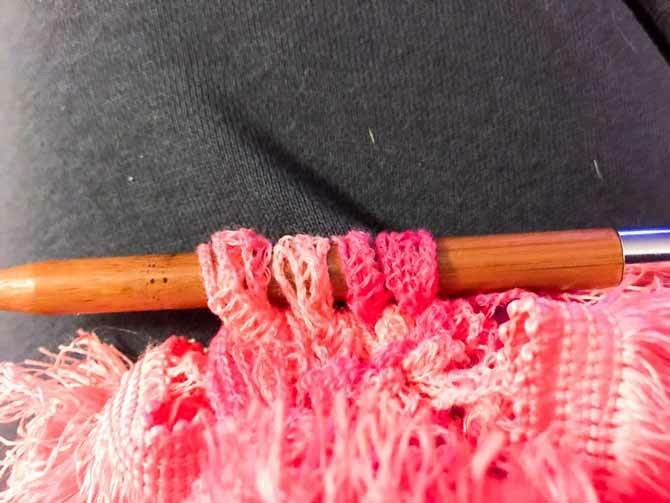 Running your thumb along the inside as you knit makes it open right up. The Rows of Ruffles pillow is something that I would dearly love to try; I relish in the thought it will turn out so soft. This pattern is linked to a crochet pattern and my crochet skills leave something to be desired, so I would knit the whole thing. 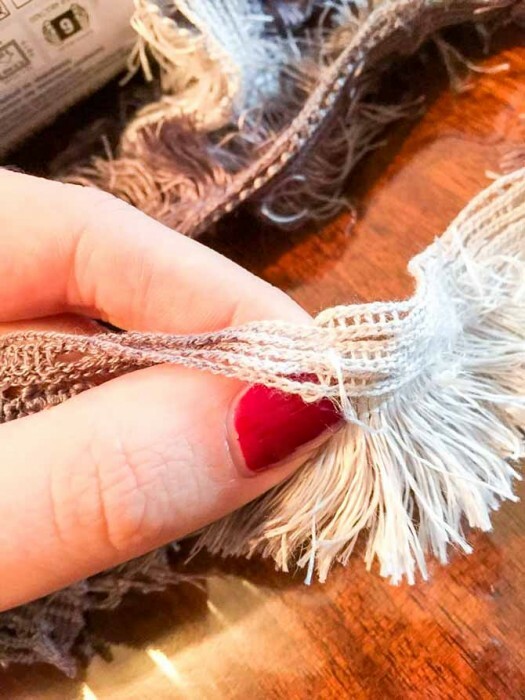 To convert this pillow pattern to a knitting pattern find your knitting gauge using Sashay Fringe, lift up the ruffles to the stitches underneath. My gauge was 4 stitches in 1″, so if my pillow was 22″ around, I would have to cast on 88 stitches to cover that pillow. This isn’t a proper pattern, just some quick and dirty math to get the knitted pillow you want. You’ll might have to keep an eye on a pillow like that to make sure it doesn’t migrate to a friend’s home. It would be a great idea for covering old pillows that are faded or stained. Furthermore, it works up so quickly, you can make several to give to your girlfriends for the upcoming holiday season. Knit it up in their favorite color or in the color to match up with their decor. 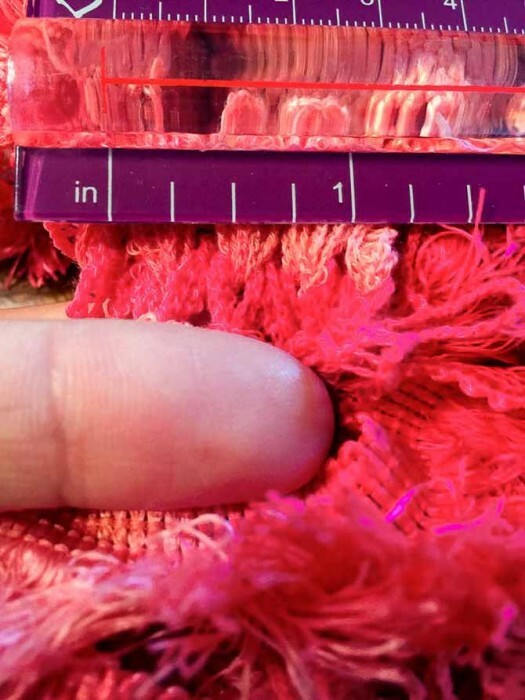 The stitches can be seen between my finger and the ruler, that is one row of four stitches. Knitting a scarf with Sashay Fringe isn’t the only thing. 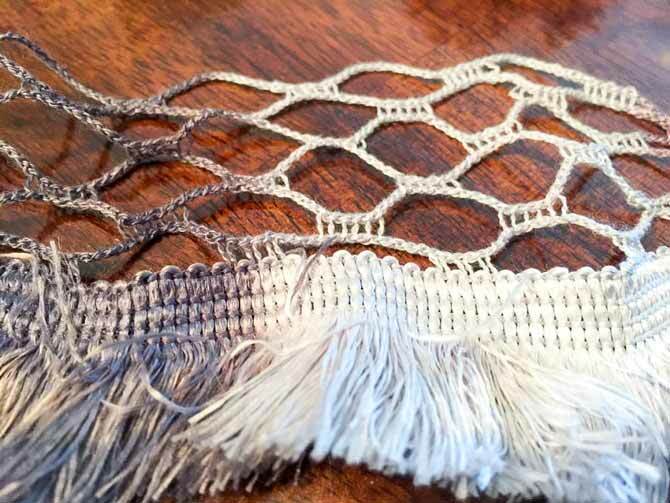 With the many patterns out there for ruffle yarn, there’s no end to the accessories you can make, as there are several benefits of knitting with Sashay Fringe yarn. All those patterns will be brand new again when knit with Sashay Fringe. The little edge of fur brings a totally different look to your favorite patterns. Give it a whirl!